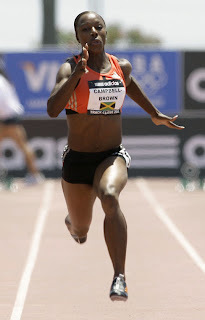 Having settled into her new home in Atlanta, Veronica Campbell Brown is eagerly looking forward to a good 2010 season after her injury affected 2009 one. A trip to Singapore to help promote the first Youth Olympics and attending the wedding of a former teammate highlighted the latter part of the year. “Happy New Year to each of you! A new year brings new challenges and of course new success I am hoping you and I will have more of the latter. The year closed for me somewhat quietly here in Georgia as my husband Omar and training mate Shereefa Lloyd went to dinner then to our church to bring in 2010. Prior to that there was nothing quiet about my December. Early in the month I made my first trip to Singapore. My training partner, Dexter Lee and I as well as Asafa Powell went to the Asian island on behalf of the Jamaican government in what I can best describe as an exchange program. Singapore will this year host the first Youth Olympic Games so the three of us were there to promote this. In exchange, the Jamaican government will obtain grants to conduct repairs on both the National Stadium track and the warm-up track. I had an incredible time there, though rushed, and must say I was very impressed with the cleanliness of the island as well as the peaceful nature of the citizens. They will make very good hosts! I also took a quick trip back home for Steve Mullings’ wedding. Steve and I attended the same high school (Vere Technical) and junior college (Barton). I was able to spend Christmas with both Omar’s family and my family, however, due to training, I was not able to partake at the table as I would have liked….LOL. It is back to training now in rather chilly temperatures here in Georgia and I prepare with a view of competing indoors. My competitive schedule is still being worked on, however, I am looking forward to the 2010 season.